Following publication of The Great War for New Zealand I continue to write and publish on the Waikato War, including this article published in the latest Journal of the Polynesian Society that takes a more biographical approach, comparing Rewi Maniapoto of Ngāti Maniapoto and Wiremu Tamihana of Ngāti Hauā. Both were great rangatira in their own right but their reputations have contrasted significantly over time and my article critiques the still surprisingly prevalent notion of 'good' Wiremu Tamihana versus 'bad' Rewi Maniapoto (see the abstract of the article below). 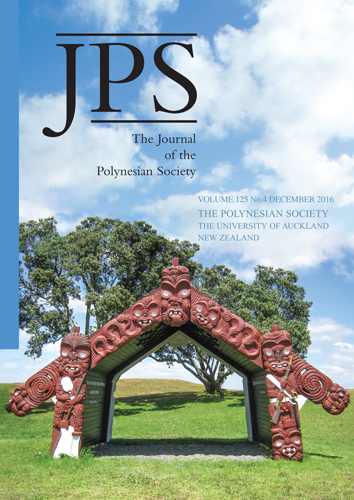 I was also delighted to have contributed the cover image for the journal, a photograph I took of the Tohu Maumahara at Rangiriri early in 2015. As discussed in my book, the monument was unveiled on the 149th anniversary of the Rangiriri battle in November 2012. Abstract: The depiction of Ngāti Maniapoto generally and Rewi Maniapoto in particular as extremists with an almost fanatical determination to fight the British runs deep in the historiography of the New Zealand Wars, all the way from John Featon to G. W. Rusden, James Cowan to Keith Sinclair and others. And a corollary argument is that Ngāti Maniapoto, through their actions and gestures, provoked the Crown (whether justly or unjustly) into launching an invasion of the Waikato district in July 1863, and then escaped virtually scot-free from the subsequent confiscation of lands. Even fierce critics of the government’s actions in the 1860s thus end up at least partly legitimising or justifying war and confiscation by reference to the supposed partial provocation of Ngāti Maniapoto and their leader. Their stance is often contrasted with that of Wiremu Tamihana, who is said to have been leader of the “moderate” Kīngitanga faction. This article argues that the differences between the two rangatira have been overstated. Wiremu Tamihana and Rewi Maniapoto had more in common than divided them. Furthermore, rather than conceptualising this in terms of “moderate” versus “extremist”, the difference between the two rangatira might be better conceptualised as idealist versus realist. Considered within the context of Māori custom, moreover, both men operated within the accepted limits of chiefly behaviour, which was concerned above all with questions of mana.